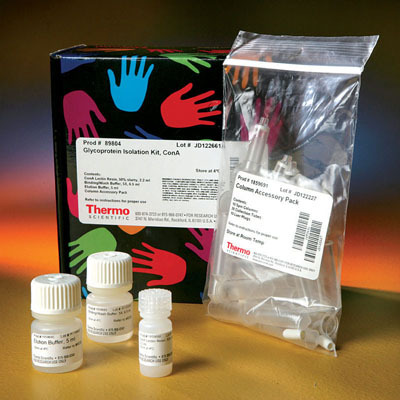 Purify glycoproteins from serum and cell lysates using affinity resins or kits with concanavilin A (ConA) or wheat germ agglutinin (WGA) lectins. These two kits use lectins concanavilin A (ConA) and wheat germ agglutinin (WGA), respectively, as ligands to bind specific classes of glycoproteins from complex protein samples. ConA lectin recognizes alpha-linked mannose and terminal glucose residues, while WGA lectin selectively binds to N-Acetyl glucosamine (GlcNAc) groups and to sialic acid. The kits include ConA or WGA beaded agarose resin, optimized binding/wash and elution buffers, and easy-to-use microcentrifuge spin columns. The kits have been used to successfully isolate glycoproteins from serum as well as HeLa and CHO cell lysates in approximately 50 minutes. Glycosylation is a post-translational modification that plays an important role in biological functions, including immune regulation, inflammation, cell-to-cell adhesion and cell signaling. Asparagine (N-linked) and serine/threonine residues (O-linked) are glycosylated during passage through the endoplasmic reticulum and golgi apparatus in eukaryotic and prokaryotic (i.e., Archaea and Eubacteria) systems. Glycoconjugates are important for immune regulation, inflammation, cell-to-cell adhesion and contact inhibition, cell signaling, protection against proteolytic degradation, and other biological processes. ConA or WGA beaded agarose resin (1.1mL), binding/wash buffer, elution buffer, and microcentrifuge spin columns and accessories.